Welcome to the Alunah store; home of official Alunah merchandise. Since first coming together in the English Midlands in 2006, Alunah have trafficked in a blend of the earthly and the unearthly. Over the course of their three albums – 2010’s Call of Avernus (Catacomb Records), 2012’s White Hoarhound (PsycheDOOMelic Records) and 2014’s Awakening The Forest (Napalm Records) – the four-piece have been a constant force of progression into an individualized take on psychedelic and organic heft. They released their fourth album Solennial in 2017 through Svart Records. 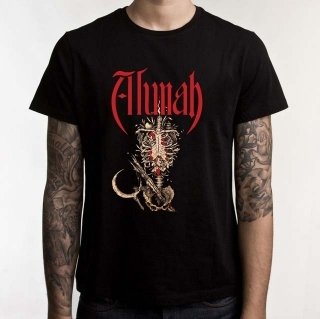 This store is managed by members of Alunah, all items are available for worldwide delivery, and are sent directly via Royal Mail from Alunah who are based in the UK. High quality 100% cotton Gildan black shirt, with silkscreened print and 2018 tour dates on the back. Design features elements from the Adrian Baxter illustrated 'Solennial' album artwork, Shirt printed by Monster Screenprints, Nottingham, England. Alunah's fourth album 'Solennial' was recorded and mixed by Chris Fielding at Skyhammer Studios, England and mastered by Greg Chandler at Priory Recording Studios, England. The album features guest appearances by Charlotte 'Chipper' Nicholls (Crippled Black Phoenix, Portishead) and Rich Harris (Oily Toys). Artwork was created by Adrian Baxter.